There is compelling evidence that estate or tower block refurbishment, in all but the most extreme cases, is both cheaper and less damaging to the local environment than demolition and new build. (Anne Power, 2008, “Does demolition or refurbishment of old and inefficient homes help to increase our environmental, social and economic viability?”). Anne Power identifies a list of issues and assumptions that are not addressed in arguments in favour of demolition. Tottenham is a great place with a rich social and architectural history, made up of vibrant, diverse and talented communities. We want to ensure this continues. The Our Tottenhamnetwork brings together 40 key local community groups, projects and campaigns standing up for the interests of people in Tottenham, especially around planning and regeneration issues (http://ourtottenham.org.uk/?page_id=31). We work together to fight for our neighbourhoods, our community facilities and the needs of our communities throughout Tottenham. This response, formulated by the Our Tottenham Planning Policy Working Group, is based on the principles embedded in the Community Charter for Tottenham agreed by the Our Tottenham network on 6 April 2013 (available here: http://ourtottenham.wordpress.com/community-charter/). This was followed up by a Community Planning for Tottenham conference in February 2014. We attach as background our recent response to Haringey Council’s consultation on Area Action Plans for Tottenham. Most local residents and businesses are happy and proud to live, work and invite their friends to Tottenham. It is already ‘a place for diverse communities that people are proud to belong to’, to use the headline of the Sustainable Community Strategy 2007-2016 approved by the Council. Consequently, the aim enshrined in the approach to planning in Tottenham – by the London Plan, the Upper Lee Valley Opportunity Area Planning Framework and the Area Action Plans for Tottenham that Haringey Council has recently consulted on – of attracting new investments, new residents, new businesses and new development to Tottenham should not be done at the expense of the existing community, i.e. by displacing local residents and local businesses; and it should actually improve the lives of existing residents (by creating jobs which locals can access and developments which generate true and significant benefits or facilities accessible to the community). Regeneration should not lead to gentrification in which local residents are forced or priced out of the area, and should not be done at the expense of the people of Tottenham. We do not want a form of regeneration which will over-develop Tottenham, which will push up house prices and private rents, reduce the amount of council housing in the area, force out small shops and businesses, encourage the exploitation of low-paid workers, and drive out large numbers of the poor and members of ethnic minorities to make way for a new higher-income population. Yes to the renewal and renaissance of the historic and much loved Wards Corner area! The Our Tottenham network, involving 40 local organisations, fully supports the Wards Corner Community Coalition and its constructive and inspirational plans for the renewal and refurbishment of the historic and iconic Wards Corner, the vibrant and unique indoor Seven Sisters market, and the neighbouring area. The implementation of the plan will ensure an end to the many years of neglect of the site, and an end to fears of evictions, demolition, displacement and loss. It will excite those living, working or visiting the area, and inspire people throughout Tottenham, Haringey, London and beyond. The Wards Corner Community Coalition should be applauded for their love of the site and area, for their care over their plans, for their engagement and involvement of those at the site and of the local communities, and for their determination to protect and improve it for the benefit of the people of Tottenham. On Saturday 1st February the Our Tottenham Community Planning Conference was attended by over 95 people representing 42 local community groups & organisations, residents associations, traders groups, education institutions and London wide networks. The conference, organised by local residents, brought this diverse range of groups together to discuss the creation of community plans in Tottenham and to share skills and knowledge. Many success stories from around the borough were shared, including the restoration of Lordship Recreation Ground, the 30 year campaign to retain the green space at Bull Lane Playing Field, and the continuing struggle to implement a community-led plan at Wards Corner. Around 100 people from all corners of the community gathered to discuss their own grass-roots vision for the future of Tottenham on Saturday. The Our Tottenham group’s community planning conference saw more than 95 people attend from 42 local community groups and organisations, residents’ associations, traders’ groups, education institutions and London-wide networks. The group hopes to create its own plans for Tottenham’s development in response to the multi-million-pound schemes being drawn up by Tottenham Hotspur, Haringey Council, Transport for London, private developers and other interest groups under the banner Plan For Tottenham. Workshops took place to discuss ideas and share skills and knowledge, leading to a final discussion to shape a vision of a community plan. Working groups were also set up develop ideas further, including those focusing on planning policy and the local economy. Developing relations with Haringey Council, sourcing funding and using powers under the Localism Act were also hot topics. There was standing room only as people of all ages and races gathered to discuss their ideas for the future face of their community. Around 100 people packed Tottenham Chances in Tottenham High Road yesterday for the ‘One Tottenham’ conference. 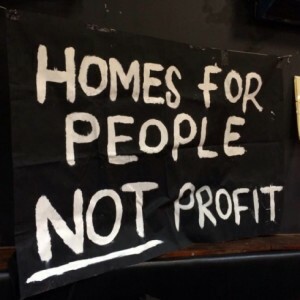 The full day event, organised by residents, was designed to allow members of the community to draw up an alternative to the “large-scale, profit-driven development” championed by Haringey Borough Council. They seek to recreate a regeneration plan that includes community facilities, housing, support for small businesses and developing local community plans from a street to neighbourhood level. Under banners proclaiming ‘Homes for People not Profit’ and ‘Street markets not Property Markets’ members of groups from inside and outside Haringey, from Kings Cross and Carpenters Estate to Wards Corner and Lordship Rec shared their ideas. 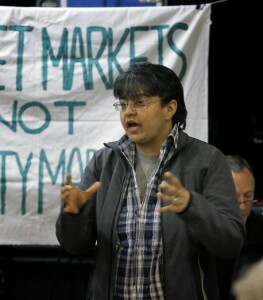 Sara Hall, who is part of the campaign to prevent the independent shops of Wards Corner being replaced by supermarkets, described how traders and residents worked to draw up their own plans for the area. https://www.eventbrite.co.uk/e/our-tottenham-community-planning-conference-tickets-10104860911See the full agenda belowTottenham is a great place with a rich social and architectural history, made up of vibrant, diverse and talented communities. We want to ensure this continues!We must challenge policies and practices that do not benefit the people of Tottenham. The Council, backed by property developers and big business, are promoting their ‘Plan for Tottenham’ – mainly large-scale, profit-driven development, increased rents, more unaffordable housing, and the loss of some independent local shops and community facilities. Its not all bad but, unless challenged, this will seriously affect our lives and our communities, and rising rents will force many local people out of the area. Together we are very powerful and can make our own plans. How do we do this? Thousands of Tottenham residents have campaigned and worked hard for years to improve their local areas and facilities. The conference will showcase and learn from some of the many inspirational examples of community-led regeneration of estates, parks, local facilities, and neighbourhoods. COME AND JOIN IN THE CONFERENCE! Campaigners calling for community-led regeneration of Tottenham will host a conference to create their own plan for the area. Our Tottenham will host the event at Tottenham Chances, in High Road, Tottenham, on Saturday, February 1. The conference has been organised by residents to bring together a wide range of community groups and organisations from across area. Campaigners will focus on sharing experiences, skills and knowledge about creating community plans and will begin working towards a community plan for Tottenham. The group’s charter calls for defence of community facilities, housing, support for small businesses and developing local community plans from a street to neighbourhood level. The meeting will run from 11am to 4pm. Tottenham is a great place with a rich social and architectural history, made up of vibrant, diverse and talented communities. We want to ensure this continues! We must challenge policies and practices that do not benefit the people of Tottenham. The Council, backed by property developers and big business, are promoting their ‘Plan for Tottenham’ – mainly large-scale, profit-driven development, increased rents, more unaffordable housing, and the loss of some independent local shops and community facilities. Its not all bad but, unless challenged, this will seriously affect our lives and our communities, and rising rents will force many local people out of the area.